Real estate classes generally follow a traditional lecture format, especially for prelicensing. But, a trend that’s catching on as an alternative to traditional lecturing is flipping the classroom, sometimes referred to as “flipped learning,” and a number of educators thinks it leads to better retention and engagement. Let’s take a look at what it is, the pros and cons for real estate students and instructors, and whether it’s right for your school. A flipped classroom focuses on helping students understand material rather than imparting knowledge. It takes the traditional format of lectures followed by homework that reinforces understanding, and it turns it on its head (“flips” it). Students watch short lectures on their own from videos and other online material, and classroom time is spent discussing what they learned. Instructors become mentors and facilitators instead of lecturers, leading debates, discussion, and other group learning activities. What are the Pros of Flipping the Classroom? Flipping the classroom is efficient and adds interest. To flip a classroom, real estate instructors can create videos and any other content that can be reused. In the classroom, there is variety and a change of pace that can make the course more interesting for the students and the instructor. A flipped classroom offers students and instructors greater flexibility. Because video lectures are online, they are available to real estate students and prelicensing candidates 24×7. Students who miss classes because of illness, work, or family emergencies don’t have to worry; they can watch the videos later to catch up. Real estate instructors have the same kind of flexibility, and for them, the flipped classroom effectively eliminates make-up assignments. Instructors can more easily see where students are having difficulty with the course material. They can use online assessments or discussion forums to identify misconceptions of the prelicensing, coaching, and continuing education material. They can then adjust what will be done in class based on this feedback. Students and candidates have more control over what they learn. Because the students watch short lectures at home, they can learn at their own pace, taking their time to learn the real estate material without getting left behind. They can pause or rewind the lectures, writing down questions for discussion with the instructors and peers in class. This can lead to improved understanding and greater odds of passing the state licensing exams. Students learn by collaborating and interacting, both of which help improve retention. Students master skills by working together, teaching, and learning real estate concepts from each other with the guidance of instructors. This gives them “ownership” of their knowledge, building confidence and enabling them to remember more of the material. Instructors can more easily identify which students are struggling and make themselves available for one-on-one conversations. Flipping the classroom generally is not a good fit for test preparation. Flipping the classroom is largely a K-12 concept. However, the courses offered by real estate schools are for adult learners who must pass licensing exams. Watching short videos and discussing them afterwards might not be the best way for them to learn and memorize the materials needed to pass these exams. The amount of course content is often decreased. With more student participation and dialogue, instructors may find that they are not able to cover as much material. This can be inconvenient in K-12 education, but it can be detrimental (and even devastating) to the success of prelicensing, continuing education, and post-licensing students. Not everyone has high-speed internet or Wi-Fi. According to a Pew Research report, in January 2018, only 67% of 18–29 year-olds had broadband access at home. Only 70% of 30–49 year-olds had it. In addition, broadband service varies widely; the slow DSL and satellite speeds in small towns and rural areas can hinder video viewing. Because real estate licensing candidates need to know specific material to earn their licenses, not having broadband access puts them at a major disadvantage. A flipped classroom adds to the instructor workload. Flipping the real estate classroom means that your instructors must tape and upload condensed lectures, which takes time and skill. Not all real estate instructors are natural video performers, nor do they necessarily have the time and equipment. Not only that, but they must introduce activities in the classroom to enhance the subject matter and motivate students to participate which some instructors see as extra work. Is Flipping the Classroom Right for Your School? Most education experts see value in flipping the classroom in adult education. 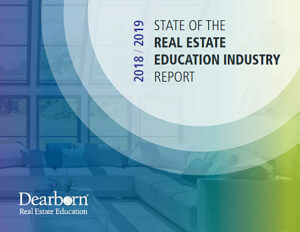 However, for a real estate school to teach candidates what they need to know to pass their state real estate and broker licensing exams, some classroom lecturing is required. That is not to say that some of this material couldn’t be offered in pre-class videos, especially toward the end of the required hours of education, so students could answer questions pertinent to passing the exams. Many experts suggest that a mix of traditional classroom and flipped classroom works well, especially for adult learners, but only if all your students can access the pre-class videos. Flipping the classroom can also add value if your school offers real estate coaching (or the post-licensing classes that some states require after passing the licensing exam). Depending on the participation and enthusiasm of instructors, it can be a creative way to differentiate your school. And if your school is already offering virtual classrooms, it would not be too difficult to record them and make them available on-demand for flipped classrooms. Variety is the spice of life—and it is often the way to rise above the competition. The more learning methods you offer your students, the more likely your school will thrive. Why not explore all the ways you can augment your education offerings with online packages? You can get started here.